Emma Byrne has retired from football following a long career which saw the goalkeeper captain the Republic of Ireland and win a UEFA Women's Cup title with Arsenal. The 38-year-old announced on Friday that she was 'hanging up her footy boots, gloves and gum shield' after more than two decades in an Ireland jersey. "It has been my honour to represent and captain our amazing country. 23 years wearing the Irish shirt has brought so many happy memories and many invaluable friendships that I will treasure for the rest of my life," said the Kildare woman, who finished up her career with Brighton and Hove Albion. "I feel extremely lucky to have carried our flag around the world. To the supporters of ladies football, you have been wonderful. "Thank you to the PFAI, SIPTU and the FAI and Irish media for making my last battle a successful one. "Last and not least, thank you to all my team-mates throughout the years, my family and friends for sharing a very happy journey with me. Adh mor Oraibh." The 'final battle' which Byrne refers to in her statement is the dispute between the Republic of Ireland's Women's National Team (WNT) and the FAI over pay and conditions earlier this year. As one of the senior players in the panel, and one of Ireland's all-time greats, Byrne led the charge and the WNT, who threatened strike action, eventually had their demands met following interventions by the PFAI and SIPTU. The 134-times capped 'keeper made her name with St Patrick's Athletic before moving to London to join the Gunners, who were at the time one of the leading clubs in women's football anywhere in the world. She stayed there for 17 years and won everything that was on offer, including that UEFA Women's Cup, a competition which was eventually renamed the Women's Champions League. Colin Bell, Ireland head Coach, paid tribute to Byrne by saying: "I'd like to thank Emma for her professionalism and her contribution to the squad in the short time that I've been the Head Coach. 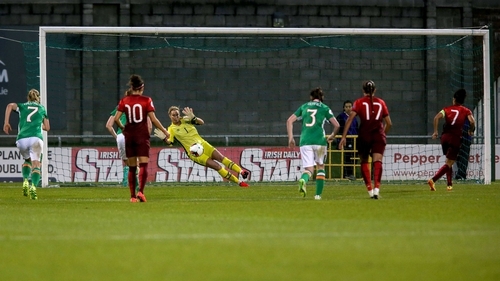 "Emma's achievements at international level are rarely seen in the game and for her to represent her country over the course of so many years is something most of us can only dream of."